Wire Specialists, Inc. provides Wire EDM cutting, EDM Hole Drilling, CNC Machining and Grinding to the Tool & Die Industry. Our goal is to excel Wire EDM cutting to the highest level of quality and accuracy. We believe utilizing new technology, employing dedicated and skilled associates, and establishing strong customer based relationships will enable us to provide the most reliable Wire EDM Service to you, our valued customer. 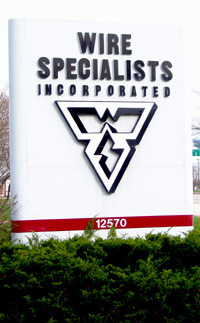 Wire Specialists is a service-oriented Wire EDM job shop that has been in business since April of 1990. We understand the need for high quality, precise workmanship and quick turnaround in our industry. With that as our goal, we pride ourselves in using state-of-the-art EDM equipment. We will do what it takes to get your job done. Our flexible hours ensure that your job will be done on time, and by skilled Wire EDM professionals. With owners John and Charlie on the job each day, your project gets special attention at every step of the way. This assures you of the highest commitment to quality service. Wire Specialists is a proud member of the Tool, Die, and Machining Association of Wisconsin. Please give us a call or e-mail us today to receive a quote on your next project involving Wire EDM, EDM Hole Drilling, CNC Machining or Grinding. © 2019 Wire Specialists, Incorporated. All Rights Reserved.